Mile 2: Crossing the Mississippi River for the last time at Muscatine, IA. As you can see from my tan lines I am also wearing for the first time my sleeveless bike jersey for the 100 degree temperatures today. Today was forecasted as the hottest day of our entire tour – high of 105 degrees in Kewanee, Ill. The entire group started biking at 7 am to try to get to Kewanee as soon as possible. 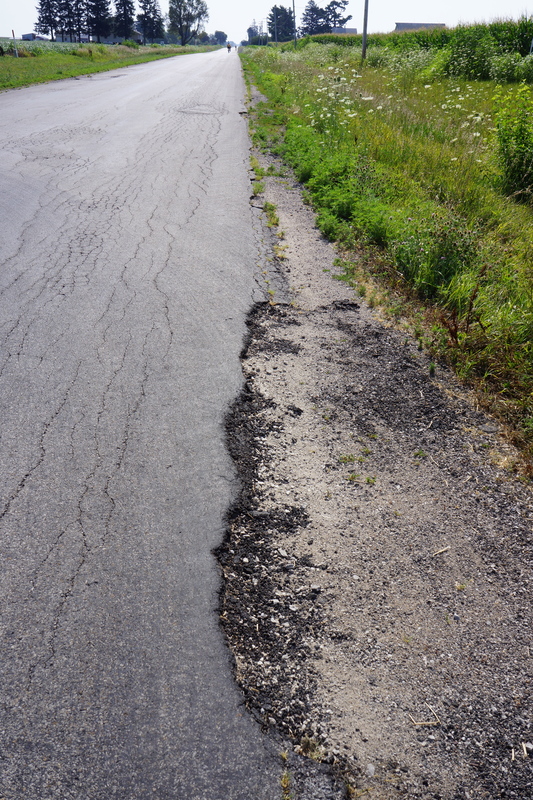 While the roads in Illinois were very smooth for the first 10 miles, they deteriorated. 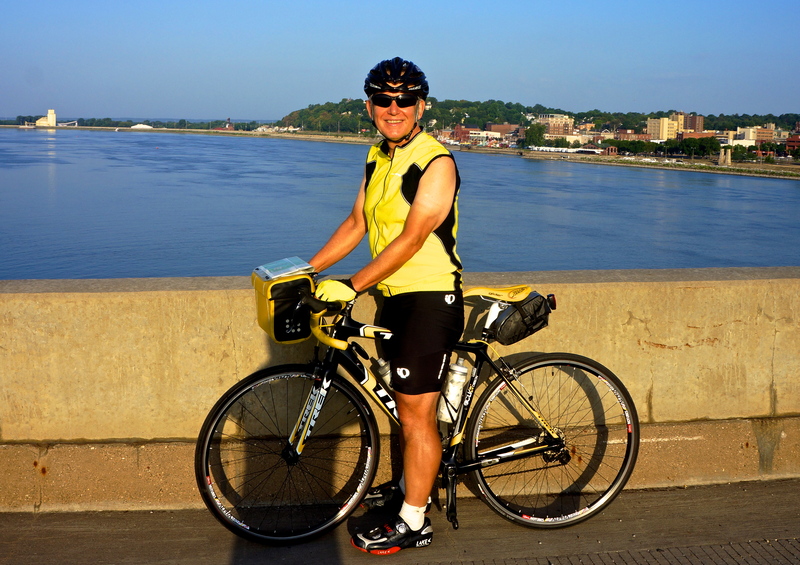 At one point we had to bike on what I would describe as 3 miles of rumble strips – I could barely focus due to the constant jarring and vibration. And then we had the bad luck to face just before Reynolds, IL a 6 mile stretch on which our side of the road had been stripped of pavement yesterday and was being prepared for repaving. While not legal or necessarily the safest action to take, I (and others in the group I was told) biked in the on-coming lane which had just been paved several days ago and was as smooth as can be. Fortunately, traffic was very light and when I saw traffic ahead I darted back to the bad side of road or pulled over to the shoulder until the traffic passed. A great experience for the day was my continued ability to maintain a higher biking speed (even in the high temperatures) – I kept up with Robert and Doug for much of the day. By the end of the day, my eyes were burning from the sweat I could no longer keep out of my eyes. When I arrived in Kewanee at 1 pm, I treated myself with a pint of peppermint stick ice cream for lunch and a two hour nap. 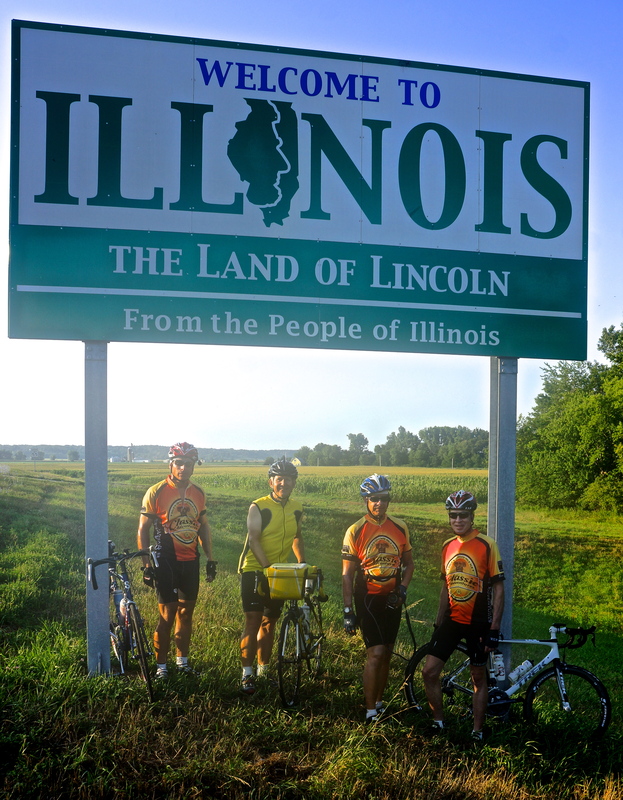 MIle 3: Entering Illinois (don’t know why the photo came out the way it did). 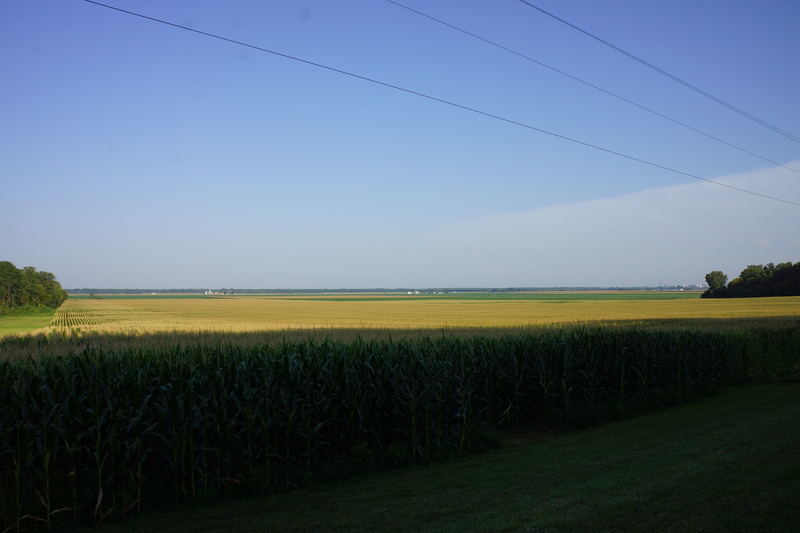 Mile 8: One of my first views of Illinois as I bike 322nd Street in Rock Island County, IL. 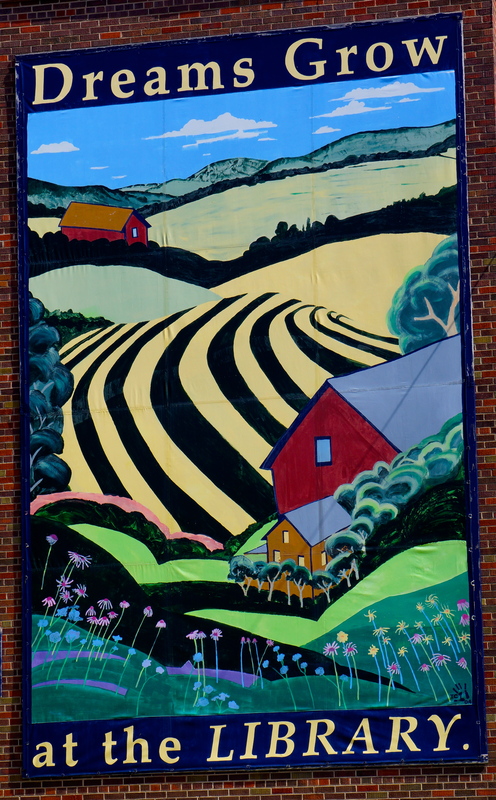 Mile 34: A striking mural on the Sherrard, Illinois Library. Mile 36: A typical road border we biked today in Illinois. Mile 67: While we passed two windmill farms in Montana and North Dakota, this one near Cambridge, IL was huge in comparison to the other two. It appeared to have hundreds of windmills spread over dozens of square miles. While at first we were surprised how many windmills were not working, it became clear as we biked it was because they were being constructed. 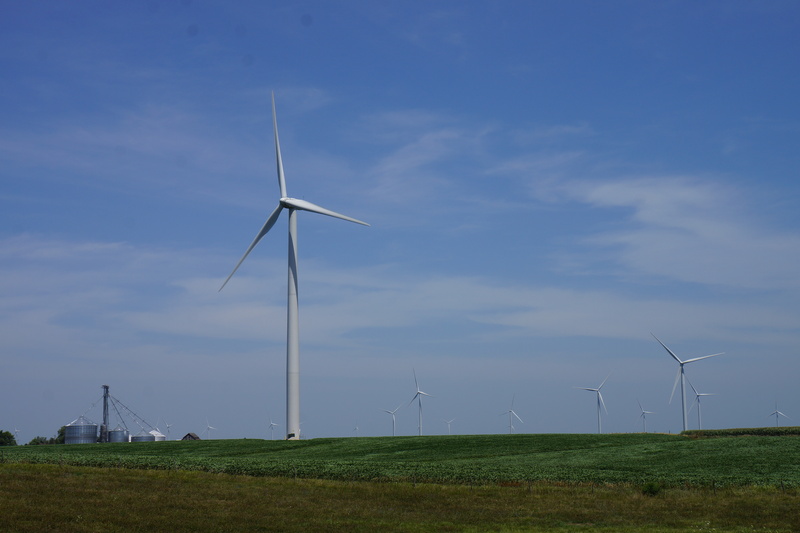 As we continued east on Route 570N we began to see the the original windmills in operation.